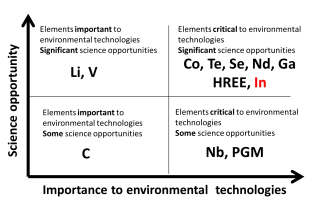 With an increasing demand for new materials containing high-tech metals, indium belongs to one of the most sough-after and thereby to the “critical” raw materials (see Fig. 1). However, our scientific knowledge of indium is characterised by a near total lack of understanding of its environmental behaviour in natural systems. Environmental studies rarely go beyond the basic reporting of indium concentrations. Yet without an understanding of the fundamental environmental behaviour of this element, exploitation of indium ore deposits and secondary resources will represent a major impediment to the sustainable development of indium resources. Fig. 1. Qualitative assessment of science opportunities and importance to environmental technologies related to critical elements including indium (Naden 2012). 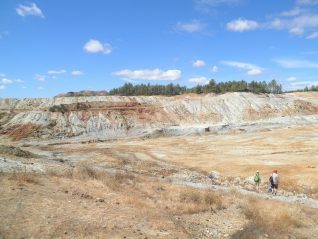 The scientific objectives of this project mainly focus on the understanding of the environmental behaviour of indium at historic mine sites of the Iberian Pyrite Belt (Spain, Portugal) (Figs. 2-5). 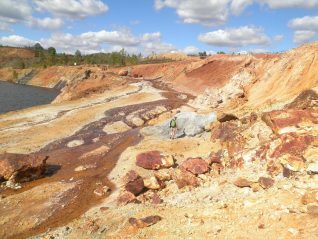 Metalliferous mine sites with their waste repositories represent excellent natural laboratories, where weathering reactions of mine wastes and dispersion processes of elements into surrounding environments can be studied. Fig. 2. 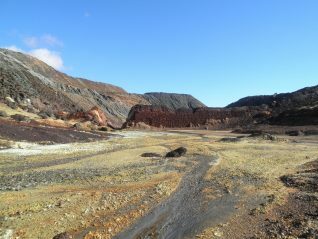 Sample location of San Telmo mine (Spain). Fig. 3. Collection location of São Domingos (Portugal). Fig. 4. 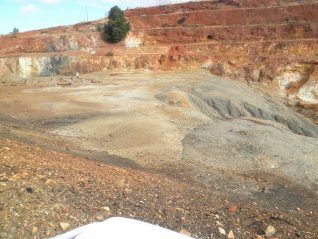 Sample location of Tharsis mine (Spain). Fig. 5. Collection of sample material from Rio Tinto mine (Spain). c. what tools are available to predict the mobilisation of indium from solid mine wastes into mine waters. This project is the first of its kind to focus on aspects that have not been explored so far. It is this uniqueness that offers significant science opportunities to conduct research of international significance. This project will substantially advance our understanding of the environmental properties and behavior of indium at metalliferous mine sites, leading to a more sustainable mineral resource development.